Apple Pay is growing steadily, with more stores, banks, credit unions, and card issuers signing on to support the service all the time. We don’t know exactly how many people use Apple Pay, but Apple reportedly wants to make its mobile payment service the default option, so using your phone to pay becomes more compelling than pulling out a card. The company has a plan: An Apple Pay program that will reward you for using the mobile payment service instead of pulling out your actual wallet, according to the New York Times. The newspaper cited two unnamed sources “familiar with Apple Pay,” but those sources didn’t give any details about what the perks would include. Target already supports Apple Pay in its app, but wants to bring the service in-store soon. One of Apple Pay’s roadblocks is the limited number of retailers that accept it. Apple is wooing those companies so iPhone 6, 6 Plus, and Apple Watch owners will be able to use Apple Pay wherever they’d like, and more stores are signing on all the time. Best Buy will support the service in-store this fall after adding Apple Pay to its app, and Target has also expressed interest in bringing Apple Pay into physical locations. The big-box retailer has supported Apple Pay in its app since the service’s launch. Target CEO Brian Cornell on Wednesday at Re/code’s Code Conference said the reason it’s taking so long to get on board with Apple Pay is the transition to chip-and-pin payment terminals, which Target aims to have in place by the holidays. Those terminals typically come equipped with Near-Field Communication technology, which would make Apple Pay support simple. 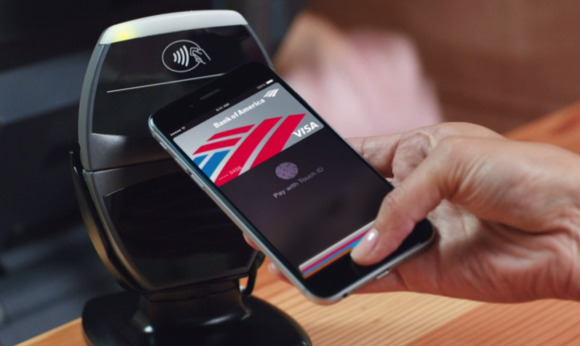 But Apple is gearing up for competition from Google, which has tried for years to push NFC payments to no avail. The company is expected to introduce Android Pay at its Google I/O developers conference this week, which will work just like Apple Pay, and include its own rewards program. It’s unclear which financial institutions and retailers will partner with Google at launch, and which phones will support the new service. Samsung is releasing its own mobile payment product, Samsung Pay, in the U.S. this summer, and may not want its users to choose between the two. Why this matters: Google and Apple have grand ambitions to make paying with your phone more simple and secure than paying with a physical card, which is good news for every person whose financial information has been leaked in merchant breach. Rewards would only sweeten the deal. We’ll find out more about Apple’s rumored Apple Pay rewards program during the company’s annual Worldwide Developers Conference, which kicks off June 8.